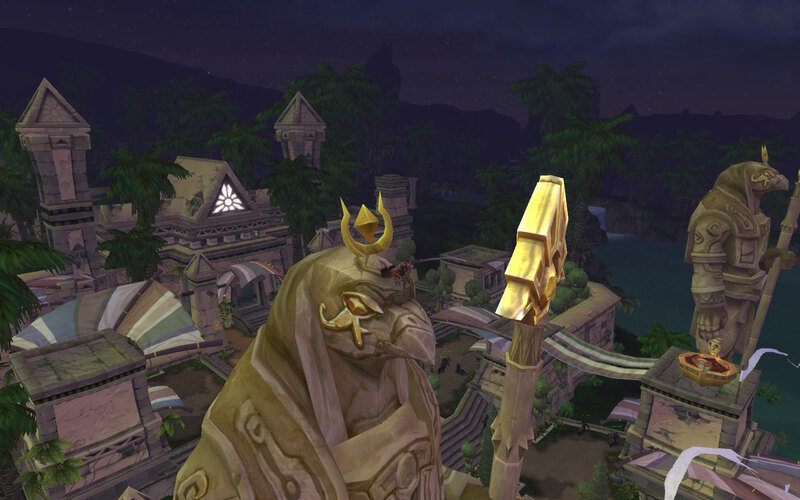 Today we have a temple complex from Uldum, which is obviously very much influenced by Egyptian architecture. While the zone isn’t my favourite, it is quite beautiful. 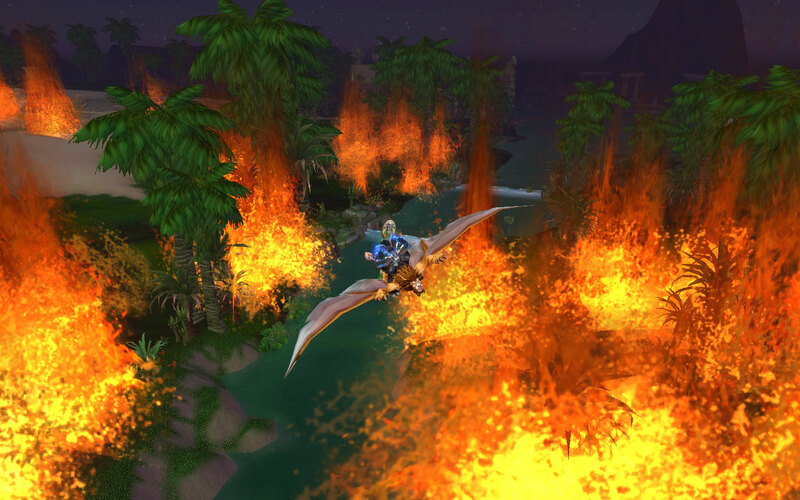 I’m back from my little vacation, and we’re right back into the thick of things in WoW. I never mentioned it, but I hit 85 before I left – the night before, as a matter of fact. The unfortunate part of this is that I get to gear up so I can get into heroics, then get the gear required to start raiding again. That is another post, thankfully. Uldum was where I hit 85, and I’m glad that I decided to go there instead of right to Twilight Highlands. It was a nice zone, but I do have to say that it wasn’t as good as the other zones have been. A number of people from a number of blogs have mentioned that there’s just too much pop culture references in the zone, namely the fact that a large chunk of the quests deal with Harrison Jones and trying to keep the Coffer of Promise away from Schnottz and the black dragons (or, Indiana Jones and trying to keep the Ark of the Covenant away from the Nazis). There were definitely some entertaining parts, but I feel that the Harrison Jones thing should be put to rest now. It was good, but just be done with it. The other half of the zone, dealing with the Ramkahen and their plight against the Neferset and the black dragon allies, was a lot of fun. There was a good variety of quests, and almost a little bit of Real-Time Strategy involved in a few of them as well. Commanding troops to move across a battlefield to defend against incoming attackers was a neat change. As I’ve said before, I’m not the best at RTS games, but I still enjoy them. I do have to say that the zone played out quite differently than I expected. At first, I expected it to be a lot like Ulduar – a big city with titan stuff in a small area, not a whole zone. There were times when it seemed they were fishing for quests, trying to make up things that people could have fun with and not caring about the story. Fortunately, I don’t care too much about times like that since I do play the game to have fun. Yet, I just think it could have been done better. You don’t get the same sense of accomplishment as you do at the end of Deepholm.